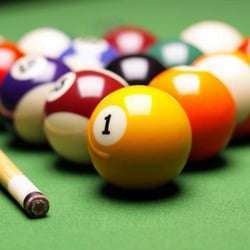 I invite you to join us this evening to play pool, have a drink and enjoy socializing with international people in friendly atmosphere. No matter, if you're an experienced player or a beginner - all levels are welcome! 1. IMPORTANT: If you sign up, please still text meProtected content to re-confirm. Please keep in mind, that without re-confirmation I will NOT put you on the guest list. 2. If you are eager to come and play, but there are no free spots left - please text me. I will put you on a waiting list and let you know, if there is a spot available. 3. Don't cancel last minute, only in case of real emergency. 4. Please, come on time and don't be late. 5. Please, order your drinks/food at the bar and pay right away. 6. When leaving, don't forget to pay your share for the table to the host. 7. Have fun, be nice and respect other cultures and styles. 8. NO SHOW policy: if you sign up for an event, but don't show up or don't cancel on time Protected content in advance, not Protected content before the event starts), next time I will give your spot to another person right away. Looking forward to play with you soon!